We combine the ancient tools of Sanskrit Mantras, Sacred Sound, Breathing, and Meditation to realign ourselves with our own True Divine Nature and foster emotional and spiritual well-being. This part of ourselves is often hidden behind our chatty minds and complicated egos. We find the experience pretty amazing, and unique each week. We find that when we consistently chant and meditate we have less stress and depression. With fewer emotional roller coasters our lives have more stability and happiness. Kirtan quiets the mind, cultivates one pointed focus, sharpens mindful awareness, and enables us to find our One Heart of Unity. Through this spiritual practice we Honor the Divinity within ourselves, others and in all life. We are learning to see everything with the eyes of Love, embracing and loving all aspects of our selves, returning to Wholehearted living. This can translate into wonderful things in your life. You’ll notice your behaviors and you’ll have the confidence to fine tune them, so your interactions with others are more fulfilling. We’re trying to grow this momentum because it’ll make our community a happier place for all. We sing together for two hours, allowing meditative silence in between. Our chants have simple words and melodies so everyone can easily participate. No need to be embarrassed or shy if you can’t hold a tune. Our musicians maintain the melody and before you know it, you’ll be following along in tune. This isn’t an organized religion. Instead, we’re inspired by the teachings of Rishis of Sanatana Dharma and Hindu festivals. Many of our sessions celebrate these festivals with special Mantras. We use the forms of Hindu deities to cultivate and bring out the good qualities within us so we can share them with others. 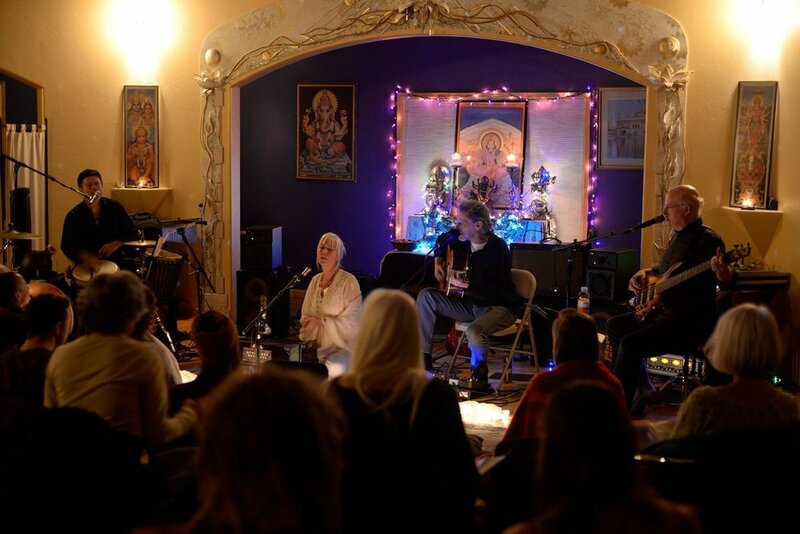 We offer Kirtan as a gift of selfless service. We are supported by your reciprocal generosity. Donations are used to cover the expenses of running the sessions, and paying our musicians for their skills and time. Many volunteers chip in so we can keep the costs as low as possible, and make every evening of shared spiritual practice fulfilling and beautiful.